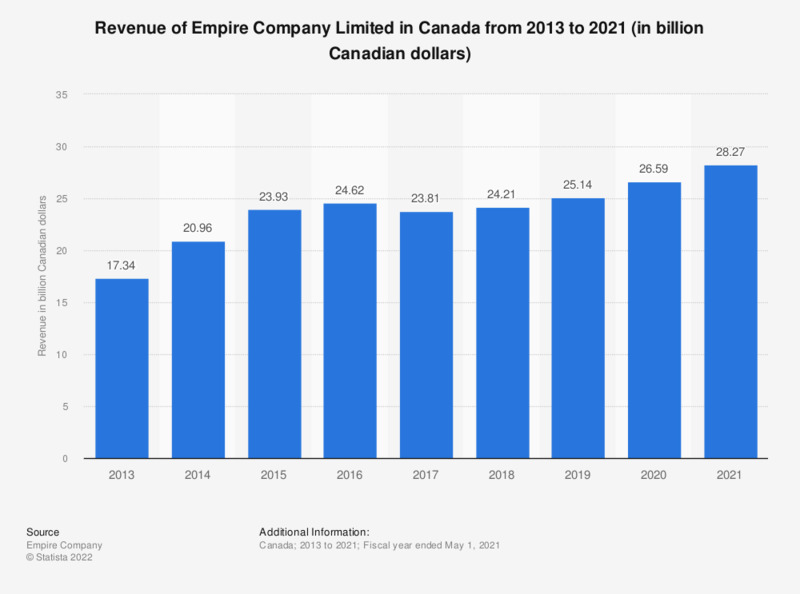 This statistic shows the revenue of Empire Company Limited in Canada from 2013 to 2018. For the 52 weeks ended May 5, 2018, Empire Company Limited generated approximately 24.21 billion Canadian dollars in sales. Empire Company Limited is a Canadian conglomerate which specialized in food retail and related real estate and investments. Founded by the Sobeys family in 1963, Empire Company made its first purchase 13 years later when it took over ownership of Lawtons Drug Stores Limited. Other Empire Company subsidiaries include the real estate investment company Crombie REIT and food retailer Sobeys. In 2016, Empire Company had more than 1,800 locations, including Sobeys stores as well as retail fuel locations. Employing more than 125 thousand people, Empire Company generated approximately 24.62 billion Canadian dollars that year. Empire Company’s leading food retail competitors include Loblaws Companies and Metro Inc. Wanting to enhance food knowledge and better nutrition among Canadian consumers, Empire Company in conjunction with Sobeys launched the Better Food Movement. Supported by Jamie Oliver, Better Food for All provides consumers with meal inspiration, recipes and how to tutorials. Fiscal year ending May 6, 2016 was a 53 week year. All other fiscal years were 52 weeks.